Seon ransomware poses a serious danger as it uses GreenFlash Sundown Exploit Kit for its distribution. Therefore, there is a high danger of getting infected and losing all of your files. Stay safe by installing reliable security software. If infected, scan the system to make sure that all the malicious components are removed. 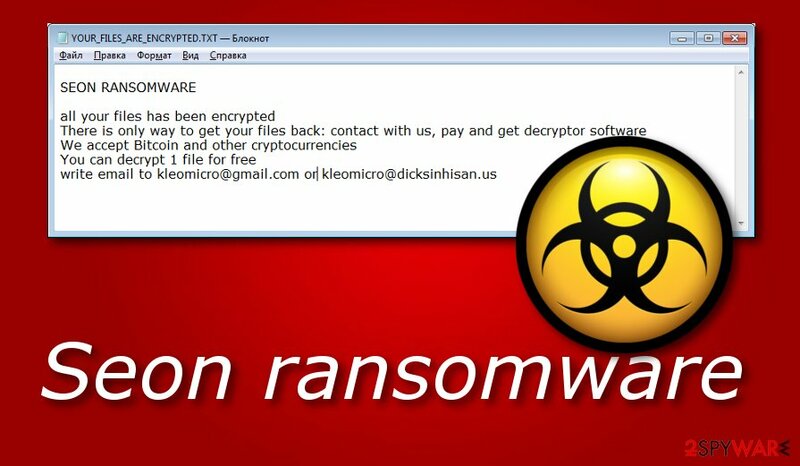 Seon ransomware is a computer virus which locks up important data and urges a ransom. Seon ransomware is a typical crypto malware that uses the AES encryption algorithm to lock data and then demands a ransom to be paid for the decryptor. It was first spotted in November 2018 and appended .FIXT file extension to documents, pictures, videos, databases, and others, although it skips system files. Seon virus dropped YOUR_FILES_ARE_ENCRYPTED.txt ransom note that disclosed contact emails of crooks: kleomicro@gmail.com and kleomicro@dicksinhisan.us. While the initial infection used phishing emails and similar methods for distribution, hackers came up with the Seon ransomware 0.1 and 0.2 on January 1st, 2019, and started circulating the malicious payload with the help of GreenFlash Sundown exploit kit. The newest variants do not differ much from their predecessor, although victims are also presented with a readme.hta along with the text ransom note. Additionally, criminals provided as three new contact email addresses for the communication. Videos, photos, audios, databases, word documents, PDFs, PPTs, etc. GreenFlash Sundown EK, spam emails, unprotected RDP, etc. As evident, cybercriminals are asking for Bitcoin or other cryptocurrencies in exchange for the decryption tool. The usage of digital wallets is preferable by hackers, as it helps them to remain anonymous while illegally asking money from their victims. Seon ransomware authors should not be trusted, as, even after transferring the payment, they might simply ignore the victim and keep the money. With the 0.1 and 0.2 versions, seems like criminals decided to develop the Seon ransomware even further, as it now started to be propagated with the help of GreenFlash Sundown EK, and included a more professionally-looking readme.hta ransom note. Additionally, while file extension remained the same, crooks provided five contact emails that, in addition to previous two emails, included landolfrizzo@mailfence.com, landolforizzo2@gmail.com, and landolforizzo2@tfwno.gf. With the release of versions 0.1 and 0.2, crooks started using more professional-looking ransom note and also employed GreenFlash Sundown exploit kit to propagate the virus. Remove Seon virus from the computer as soon as possible in order to avoid further damaging consequences. You can get rid of the threat only by downloading and installing reliable anti-malware tools. These programs will ensure you that all virus-related components are deleted and successfully removed from the system. 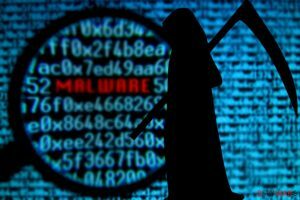 Moreover, try using software such as Reimage as it can help you detect the damage that might have been done by the ransomware virus. Performing the Seon ransomware removal is necessary if you want to recover your data. After you take care of the cyber threat, you can try using our below-provided data recovery techniques. If you carry out each step carefully, you will have a chance of recovering encrypted files such as photos, videos, audios, databases, text documents, and others. Keeping your system up to date might save you from ransomware infections. Exploit kits are designed to abuse flaws in the code of software, which makes outdated machines vulnerable. All those users have to do is visit a malicious website or get redirected, and, in a matter of seconds, the infection spreads throughout the system. Thus, do not postpone any updates and immediately patch your apps and system. According to technology experts from NoVirus.uk, ransomware viruses are distributed via phishing emails – attachments or malicious links. Hackers employ bots that send out thousands of phishing emails to thousands of users. While spoofed emails can be easily recognized by most, there will always be those who will fall for the trick and open contaminated attachment or click on a malicious link. Therefore, experts advise being extremely careful when handling emails from unknown sources, especially if the attached document is asking to enable macro function. Furthermore, rogue websites can also distribute ransomware. For example, P2P networks sometimes might include virus-related components injected into links or somewhere else. This happens because such pages do not fit the security requirements and often lack protection. If you have accidentally overcome a questionable-looking website, make sure that you close it the same second and do not think of returning. There is only one possible way to remove Seon virus – by installing a reputable antivirus program. These automatical tools are created for such kind of purposes and allow the user to carry out the removal in a safer way. Furthermore, we suggest choosing a program such as Reimage, Malwarebytes MalwarebytesCombo Cleaner, or Plumbytes Anti-MalwareMalwarebytes Malwarebytes, as these tools can detect all rogue components that might have been hiding in the computer system. Moreover, after you take care of the Seon ransomware removal, perform some system backups to ensure that the cyber threat has been disabled properly. Additionally, taking about locked files, you might have a chance of recovering them by looking thru the below-provided data recovery methods. However, all of them have their conditions that they can work under, and if you perform all steps as required, you might restore your files. Click Start → Shutdown → Restart → OK. When your computer becomes active, start pressing F8 multiple times until you see the Advanced Boot Options window. Press the Power button at the Windows login screen. Now press and hold Shift, which is on your keyboard, and click Restart..
Now select Troubleshoot → Advanced options → Startup Settings and finally press Restart. 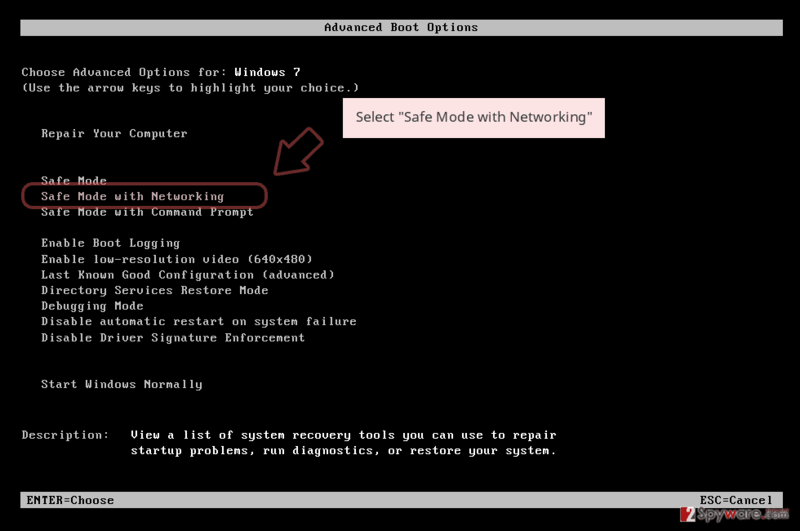 Once your computer becomes active, select Enable Safe Mode with Networking in Startup Settings window. Log in to your infected account and start the browser. Download Reimage or other legitimate anti-spyware program. Update it before a full system scan and remove malicious files that belong to your ransomware and complete Seon removal. 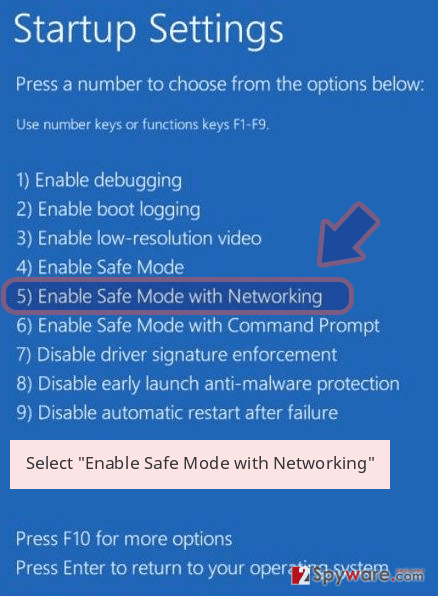 If your ransomware is blocking Safe Mode with Networking, try further method. 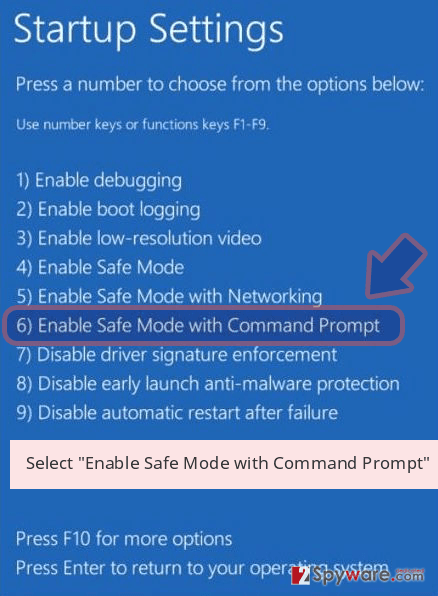 Once your computer becomes active, select Enable Safe Mode with Command Prompt in Startup Settings window. 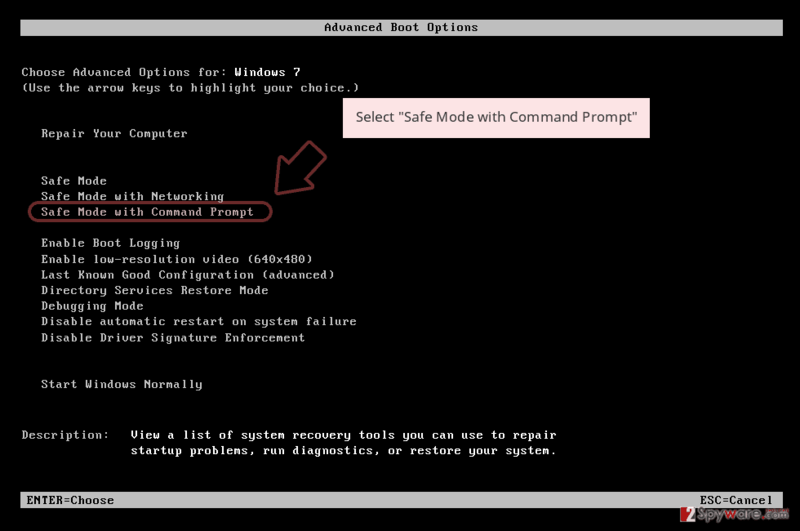 Once the Command Prompt window shows up, enter cd restore and click Enter. 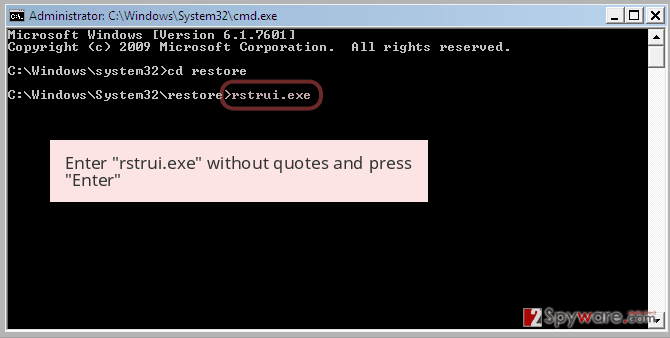 Now type rstrui.exe and press Enter again.. 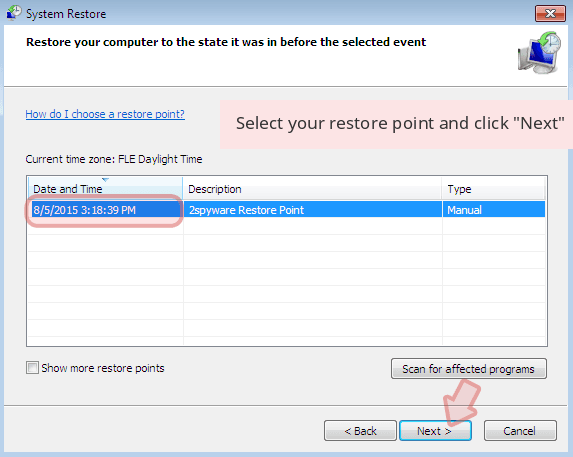 When a new window shows up, click Next and select your restore point that is prior the infiltration of Seon. After doing that, click Next. Now click Yes to start system restore. Once you restore your system to a previous date, download and scan your computer with Reimage and make sure that Seon removal is performed successfully. Guide which is presented above is supposed to help you remove Seon from your computer. To recover your encrypted files, we recommend using a detailed guide prepared by 2-spyware.com security experts. Finding files with the .FIXT appendix means that Seon ransomware has infiltrated your computer and encrypted all files. In order to restore your data back, try our below-given tools and complete the data recovery process. This method might be truly helpful and let you get important files back if you use it exactly as shown in the instructions. If your files have been corrupted in a particular way, try out this tool. 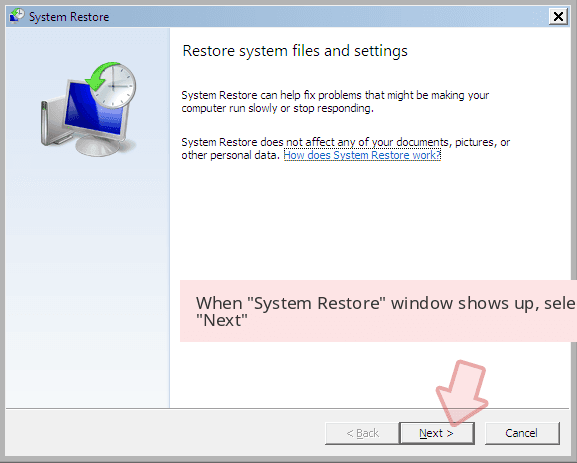 However, note that it might not work if you did not enable the System Restore feature in the past. Here, check each of available copies of the file in “Folder versions”. You should select the version you want to recover and click “Restore”. If the ransomware virus did not erase Shadow Volume Copies of encrypted files, this method might let you recover your documents. Right-click on the folder you want to restore and select “Export”. You can also select where you want it to be stored. Experts are currently working on the Seon ransomware decryption tool. ^ Phishing. Wikipedia. The free encyclopedia. ^ Cryptocurrency. Investopedia. Worldwide definitions. ^ NoVirus.uk. NoVirus. Malware news. ^ P2P. Tech terms. Tech-related information. This entry was posted on 2019-01-07 at 05:29 and is filed under Ransomware, Viruses. How to identify an email infected with a virus? You can quickly scan the QR code with your mobile device and have Seon ransomware manual removal instructions right in your pocket. How did you remove Seon virus?